The wildfires in California have consumed more than 1.6 million acres of land this year – nearly half of a million acres more than last year (Kasler, November 16 2018). The immediate devastation caused by the fires is evident – thousands of homes burned, hundreds of deaths, and many more still missing. But the burning of millions of tons of biomass has an even more insidious effect. Wildfire smoke plumes, propelled by winds, release clouds of particulate matter – in particular, PM2.5—which can enter through the lungs into the bloodstream posing serious health risks. PM2.5 levels in parts of California reached nearly 470 micrograms, more than 30 times the EPA prescribed safe limit of 15 micrograms (Coren, November 17 2018). To understand the human cost of breathing such heavily polluted air, the United States can look toward developing countries where living with hazardous levels of polluted air is a way of life. In the past few weeks, air quality in parts of California has been some of the worst in the world, comparable to Beijing and Delhi. Exposure to particulate air pollution has short-term adverse health effects ranging from respiratory infections and cardiovascular disease to heightened mortality risk amongst the elderly (Reid et al. 2016; Liu et al. 2015; Miller et al. 2017). Apart from these immediate, visible effects, air pollution can have longer lasting health effects for the most vulnerable population. Even at low levels, exposure to particulate pollution during pregnancy can lead to adverse birth outcomes such as premature births and low birth weight (Currie and Walker 2011). But what happens when pregnant mothers are exposed to the unprecedented pollution levels currently seen in California? To understand the effects of exposure to extreme levels of pollution, we turn to India where every winter a widespread agricultural practice engulfs the country in a blanket of smoke. Each winter the hinterland around India’s cities lights up into thousands of tiny fires when seen from space. These are not “wild” fires, but deliberate burning carried out by farmers to clear crop residue and prepare their land for planting the next crop (Schultz et al., October 30 2018). Winds drive the smoke and soot from these tiny fires into nearby cities, adding to the already high levels of pollution (Slater, Ocotober 15 2018). The pollution levels become so high in the national capital region of India that flights are regularly canceled due to poor visibility , schools are shut down to protect children from exposure, and as in California this year, Google searches for facemasks skyrocket (Wootson, November 12 2017; Pandey, August 11 2017; Bansal and Kumar, Januar 3 2018). 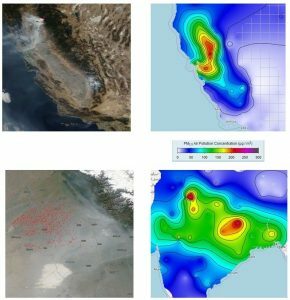 The satellite imagery below shows how the Indian agricultural fire experience compares to the Californian wildfires during the week of Nov. 12, 2018 (Figure 1). Smoke plumes from wildfires in the north can be seen spreading across California. In the image over northern India red pixels showing agricultural fires dot the landscape and a haze of smoke hangs over the entire region. The PM2.5 levels over California are as bad as that seen over the Indian subcontinent – both going well beyond safe limits. 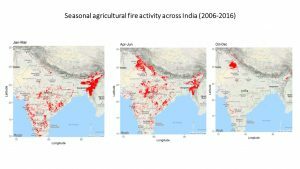 In a new study (Pullabhotla 2018), I examine the effects of pollution due to these agricultural fires in India on infant mortality levels. I use satellite data from NASA to map the location of farm fires over India for each day from 2006-2016. Over this period, nearly 800,000 “fire pixels” light up across the country as seen in the maps below (Figure 2). When fires occur in the direction from which the wind is blowing, they bring in particulate matter and increase pollution. So, what does this mean for infant mortality? To answer this question, I match the fire activity to the location and timing of nearly half-a-million births. I then use satellite data on wind direction and isolate the exposure to up-wind fires for each of these. The results show that a 10 microgram increase in PM2.5 results in 135,000 additional infant deaths per year. California saw PM2.5 levels rise more than 200 micrograms in the past few weeks. What does this imply for the U.S. experience? Even though healthcare standards and wealth levels in the U.S. are far better than those in India, the impact of extreme pollution on infant mortality should serve as a cautionary tale for the U.S. In the past, wildfires in the U.S. mostly occurred in sparsely populated areas and with a lower frequency. However, climate change and growing urbanization are changing that (Westerling and Bryant 2008). With hotter summers and housing markets expanding closer to wildlands, more frequent exposure to extreme pollution levels is likely to occur in the U.S. as well. The increased frequency and the growing share of the population exposed to pollution imply that policymakers and researchers need to focus on the risks that wildfires pose for infant mortality in the U.S.
Bansal, S., and H. Kumar. 2018. “What we know and what we do not know about pollution in India.” Hindustan Times. Available at: https://www.hindustantimes.com/india-news/what-we-know-and-what-we-do-not-know-about-pollution-in-india/story-tS2QF3cyeR1Q9me90Lt59O.html [Accessed November 21, 2018]. Berkeley Earth. 2018. “Air Quality Real-time Map.” Available at: http://berkeleyearth.org/air-quality-real-time-map/ [Accessed November 21, 2018]. Coren, M.J. 2018. “California’s wildfires: what you need to know about air pollution.” Quartz. Available at: https://qz.com/1466111/californias-air-was-among-the-worlds-worst-this-week-climate-change-makes-that-the-new-normal/ [Accessed November 21, 2018]. Currie, J., and R. Walker. 2011. “Traffic congestion and infant health: Evidence from E-Zpass.” American Economic Journal: Applied Economics 3(1):65–90. Available at: http://pubs.aeaweb.org/doi/10.1257/app.3.1.65 [Accessed November 21, 2018]. Kasler, D. 2018. “Worst wildfire year since when? More California acres have burned in 2018 than the past decade.” The Sacramento Bee. Available at: https://www.sacbee.com/latest-news/article221788220.html [Accessed November 21, 2018]. Liu, J.C., G. Pereira, S.A. Uhl, M.A. Bravo, and M.L. Bell. 2015. “A systematic review of the physical health impacts from non-occupational exposure to wildfire smoke.” Environmental Research 136:120–132. Available at: https://www.sciencedirect.com/science/article/pii/S0013935114003788 [Accessed November 21, 2018]. Miller, N., D. Molitor, and E. Zou. 2017. “Blowing Smoke: Health Impacts of Wildfire Plume Dynamics.” Available at: https://static1.squarespace.com/static/56034c20e4b047f1e0c1bfca/t/59e2e4fe0100271556d54e1a/1508041986866/smoke_MMZ_201710.pdf [Accessed November 21, 2018]. National Aeronautics and Space Admnistration (NASA). 2018a. “Firms FAQ | Earthdata.” FIRMS FAQ. Available at: https://earthdata.nasa.gov/faq/firms-faq#ed-fire-detection [Accessed January 20, 2018]. National Aeronautics and Space Admnistration (NASA). 2018b. “NASA Worldview application.” Available at: https://worldview.earthdata.nasa.gov [Accessed November 21, 2018]. Pandey, A. 2017. “India: Delhi closes schools as air pollution hits hazardous levels.” DW. Available at: https://www.dw.com/en/india-delhi-closes-schools-as-air-pollution-hits-hazardous-levels/a-41272486 [Accessed November 21, 2018]. Pullabhotla, H. 2018. “Fires, Wind, and Smoke: Air Pollution and Infant Mortality.” Available at: https://www.dropbox.com/s/55kc2buzqh2t3t7/Hemant_Pullabhotla_JMP.pdf?dl=0 [Accessed November 21, 2018]. Reid, C.E., M. Brauer, F.H. Johnston, M. Jerrett, J.R. Balmes, and C.T. Elliott. 2016. “Critical review of health impacts of wildfire smoke exposure.” Environmental Health Perspectives 124(9):1334–1343. Available at: http://ehp.niehs.nih.gov/14-09277 [Accessed November 21, 2018]. Schultz, K., J. Gettleman, H. Kumar, and A. Venkataraman. 2018. “As World’s Air Gets Worse, India Struggles to Breathe – The New York Times.” New York Times. Available at: https://www.nytimes.com/2018/10/30/world/asia/india-air-pollution.html [Accessed November 21, 2018]. Slater, J. 2018. “India is trying to prevent apocalyptic air pollution. Step 1: Stop farmers from burning their fields.” The Washington Post. Available at: https://www.washingtonpost.com/world/asia_pacific/india-is-trying-to-prevent-apocalyptic-air-pollution-step-1-stop-farmers-from-burning-their-fields/2018/10/15/79d3fd52-cb20-11e8-ad0a-0e01efba3cc1_story.html?noredirect=on&utm_term=.c3b2f265c162 [Accessed November 21, 2018]. Westerling, A.L., and B.P. Bryant. 2008. “Climate change and wildfire in California.” Climatic Change 87(S1):231–249. Available at: http://link.springer.com/10.1007/s10584-007-9363-z [Accessed November 21, 2018]. Wootson, C. 2017. “US airline cancels all flights to New Delhi amid toxic smog crisis.” The Independent. Available at: https://www.independent.co.uk/news/world/asia/united-cancels-flights-new-delhi-dangerous-smog-asia-environment-latest-a8050611.html [Accessed November 21, 2018].